An extinction event (also known as a mass extinction or biotic crisis) is a widespread and rapid decrease in the amount of life on earth. Such an event is identified by a sharp change in the diversity and abundance of macroscopic life. It occurs when the rate of extinction increases with respect to the rate of speciation. Because the majority of diversity and biomass on Earth is microbial, and thus difficult to measure, recorded extinction events affect the easily observed, biologically complex component of the biosphere rather than the total diversity and abundance of life. Over 98% of documented species are now extinct, but extinction occurs at an uneven rate. Based on the fossil record, the background rate of extinctions on Earth is about two to five taxonomic families of marine invertebrates and vertebrates every million years. Marine fossils are mostly used to measure extinction rates because of their superior fossil record and stratigraphic range compared to land organisms. Since life began on Earth, several major mass extinctions have significantly exceeded the background extinction rate. 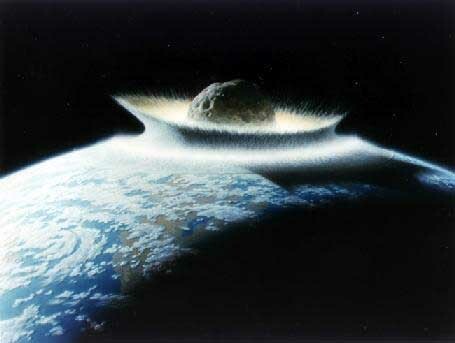 The most recent, the Cretaceous-Paleogene extinction event, which occurred approximately 66 million years ago (Ma), was a large-scale mass extinction of animal and plant species in a geologically short period of time. In the past 540 million years there have been five major events when over 50% of animal species died. 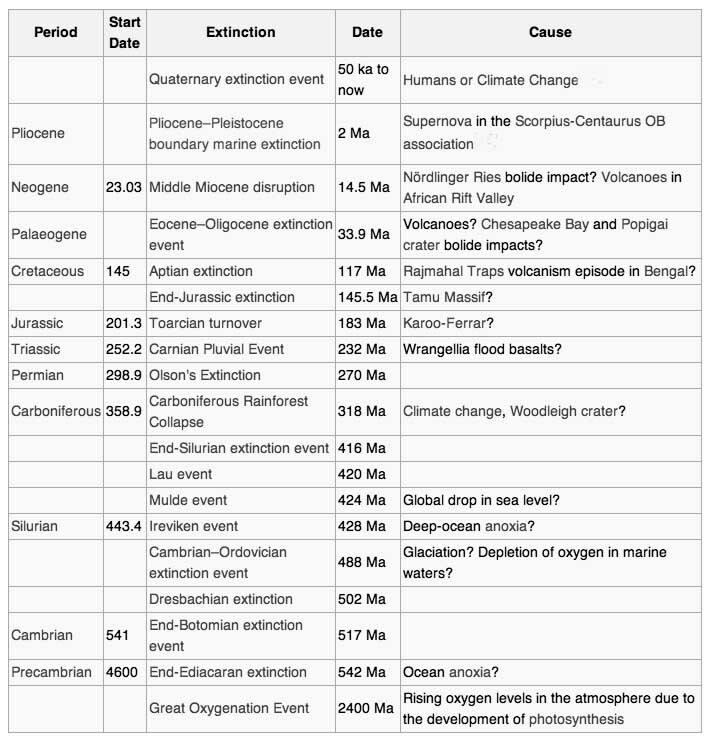 Mass extinctions seem to be a Phanerozoic phenomenon, with extinction rates low before large complex organisms arose. Estimates of the number of major mass extinctions in the last 540 million years range from as few as five to more than twenty. These differences stem from the threshold chosen for describing an extinction event as "major", and the data chosen to measure past diversity. There is debate about the causes of all mass extinctions. In general, large extinctions may result when a biosphere under long-term stress undergoes a short-term shock. An underlying mechanism appears to be present in the correlation of extinction and origination rates to diversity. High diversity leads to a persistent increase in extinction rate; low diversity to a persistent increase in origination rate. These presumably ecologically controlled relationships likely amplify smaller perturbations (asteroid impacts, etc.) to produce the global effects observed. In a landmark paper published in 1982, Jack Sepkoski and David M. Raup identified five mass extinctions. They were originally identified as outliers to a general trend of decreasing extinction rates during the Phanerozoic, but as more stringent statistical tests have been applied to the accumulating data, the "Big Five" cannot be so clearly defined, but rather appear to represent the largest (or some of the largest) of a relatively smooth continuum of extinction events. Cretaceous-Paleogene extinction event (End Cretaceous, K-T extinction, or K-Pg extinction): 66 Ma at the Cretaceous.Maastrichtian-Paleogene.Danian transition interval. The K-T event is now officially called the Cretaceous-Paleogene (or K-Pg) extinction event in place of Cretaceous-Tertiary. About 17% of all families, 50% of all genera and 75% of all species became extinct. In the seas it reduced the percentage of sessile animals to about 33%. The majority of non-avian dinosaurs became extinct during that time. The boundary event was severe with a significant amount of variability in the rate of extinction between and among different clades. Mammals and birds emerged as dominant land vertebrates in the age of new life. Triassic-Jurassic extinction event (End Triassic): 200 Ma at the Triassic-Jurassic transition. About 23% of all families, 48% of all genera (20% of marine families and 55% of marine genera) and 70% to 75% of all species went extinct. Most non-dinosaurian archosaurs, most therapsids, and most of the large amphibians were eliminated, leaving dinosaurs with little terrestrial competition. Non-dinosaurian archosaurs continued to dominate aquatic environments, while non-archosaurian diapsids continued to dominate marine environments. The Temnospondyl lineage of large amphibians also survived until the Cretaceous in Australia (e.g., Koolasuchus). Permian-Triassic extinction event (End Permian): 251 Ma at the Permian-Triassic transition. Earth's largest extinction killed 57% of all families, 83% of all genera and 90% to 96% of all species. (53% of marine families, 84% of marine genera, about 96% of all marine species and an estimated 70% of land species, including insects. The evidence of plants is less clear, but new taxa became dominant after the extinction. The "Great Dying" had enormous evolutionary significance: on land, it ended the primacy of mammal-like reptiles. The recovery of vertebrates took 30 million years, but the vacant niches created the opportunity for archosaurs to become ascendant. In the seas, the percentage of animals that were sessile dropped from 67% to 50%. The whole late Permian was a difficult time for at least marine life, even before the "Great Dying". Late Devonian extinction: 375-360 Ma near the Devonian-Carboniferous transition. At the end of the Frasnian Age in the later part(s) of the Devonian Period, a prolonged series of extinctions eliminated about 19% of all families, 50% of all genera and 70% of all species.This extinction event lasted perhaps as long as 20 Ma, and there is evidence for a series of extinction pulses within this period. Ordovician-Silurian extinction event (End Ordovician or O-S): 450-440 Ma at the Ordovician-Silurian transition. Two events occurred that killed off 27% of all families, 57% of all genera and 60% to 70% of all species. Together they are ranked by many scientists as the second largest of the five major extinctions in Earth's history in terms of percentage of genera that went extinct. Despite the popularization of these five events, there is no fine line separating them from other extinction events; indeed, using different methods of calculating an extinction's impact can lead to other events featuring in the top five. Older fossils are harder to find because they are usually buried at a considerable depth in the rock. Dating older fossils is more difficult. Productive fossil beds are researched more than unproductive ones, therefore leaving certain periods unresearched. Prehistoric environmental disturbances can disturb the deposition process. The preservation of fossils varies on land, but marine fossils tend to be better preserved than their sought after land-based counterparts. It has been suggested that the apparent variations in marine biodiversity may actually be an artifact, with abundance estimates directly related to quantity of rock available for sampling from different time periods. However, statistical analysis shows that this can only account for 50% of the observed pattern, and other evidence (such as fungal spikes) provides reassurance that most widely accepted extinction events are indeed real. A quantification of the rock exposure of Western Europe does indicate that many of the minor events for which a biological explanation has been sought are most readily explained by sampling bias. Mass extinctions have sometimes accelerated the evolution of life on Earth. When dominance of particular ecological niches passes from one group of organisms to another, it is rarely because the new dominant group is "superior" to the old and usually because an extinction event eliminates the old dominant group and makes way for the new one. For example mammaliformes ("almost mammals") and then mammals existed throughout the reign of the dinosaurs, but could not compete for the large terrestrial vertebrate niches which dinosaurs monopolized. The end-Cretaceous mass extinction removed the non-avian dinosaurs and made it possible for mammals to expand into the large terrestrial vertebrate niches. Ironically, the dinosaurs themselves had been beneficiaries of a previous mass extinction, the end-Triassic, which eliminated most of their chief rivals, the crurotarsans. Another point of view put forward in the Escalation hypothesis predicts that species in ecological niches with more organism-to-organism conflict will be less likely to survive extinctions. This is because the very traits that keep a species numerous and viable under fairly static conditions become a burden once population levels fall among competing organisms during the dynamics of an extinction event. Furthermore, many groups which survive mass extinctions do not recover in numbers or diversity, and many of these go into long-term decline, and these are often referred to as "Dead Clades Walking". So analyzing extinctions in terms of "what died and what survived" often fails to tell the full story. Darwin was firmly of the opinion that biotic interactions, such as competition for food and space - the 'struggle for existence' - were of considerably greater importance in promoting evolution and extinction than changes in the physical environment. He expressed this in The origin of species: Species are produced and exterminated by slowly acting cause ... and the most import of all causes of organic change is one which is almost independent of altered ... physical conditions, namely the mutual relation of organism to organism-the improvement of one organism entailing the improvement or extermination of others. The theory, known as 'co-extinctions', means an organism dies out because it depends on another doomed species. Researchers say the end of all life is a worst case scenario, but warn the 'domino effect' could dramatically increase the risks of climate change - and found 5-6 degrees of average warming globally is enough to wipe out most life on the planet.